A few weeks back I received an email from Bee together with invitation to do a Bento related guest post at Rasa Malaysia. 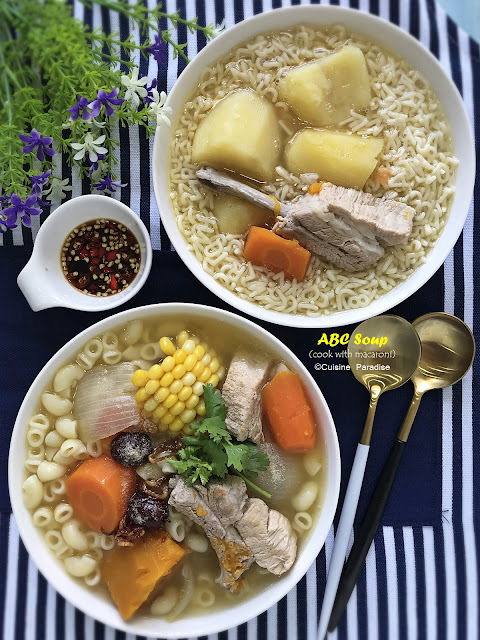 I was so surprise after reading her email because for so many years I have being one of her silent readers whom always drool over her mouthwatering photos and recipes which our family enjoys. And today I am so honor to be one of the invited guests to share my bento post with all her readers. For this post, instead of Angry Birds I will be sharing two Mickey Bento which I have discussed with Bee. First bento set can be used for either Lunch/Dinner as it comes with soup, rice, veggie, prawn and fresh fruit. While the second set will be more suitable for breakfast, tea-snack or field trip outing. 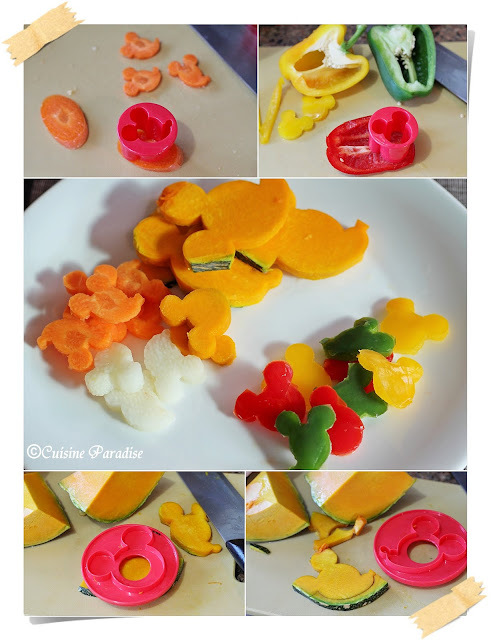 Different Mickey shapes cutout from pumpkin, carrot, Chinese yam(huai shan) and assorted colour of capsicums for making the soup and stir-fry. 1. Blanched spare ribs in boiling water for 1 minute remove rinse and set aside. 3. Bring 1.2 litres of water to boil, add in all ingredients except the reserved “Mickey” shaped cutouts. 4. Lower the heat and simmer for about 20 minutes, next place the mickey cutouts on a metal soup ladler lower into the simmering soup and cook for 15 seconds. Remove and set aside in serving bowl. 5. Ladle warm soup into the bowl before serving. 1. Place a sheet of cling wrap on one hand and scoop about 2 tablespoons of cooked rice on it. Shape the rice into a ball. 2. Remove the cling wrap and place it on a paper cup liner while working on the two ears on the side. 3. Using the same cling wrap scoop 1 teaspoon of cooked rice on it and shaped into semi-circle. Open the cling wrap and cover the rice ball with a 4cm diameter round nori sheet to form the ear. 4. Repeat step 3 again. Next place the 1st round rice ball onto a cling wrap, using 2cm long thin spaghetti to attach the ears on the side of rice ball. 5. Shaped these three parts of the mickey features tightly using the cling wrap and your hands. 6. When done remove the wrapper and place it on the paper cup liner into the assigned box and start adding the facial expression using mickey shape cutter, cheese and carrot shown above. 7. To make the eye balls and nose, use a craft puncher on a nori sheet to get small oval shapes and paste it on the cutout cheese. 8. 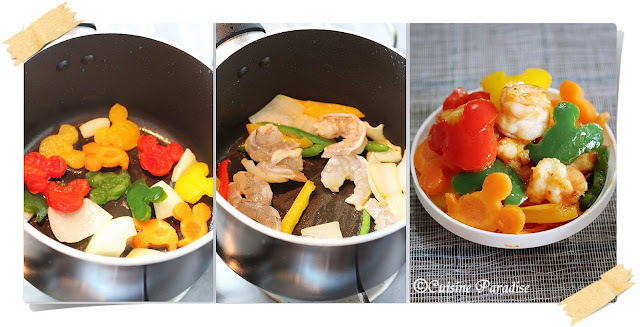 For the vegetables; preheat a small saucepan with 1 teaspoon of cooking oil sauté the garlic till fragrant before adding vegetable. Give a quick stir and cook for 30 second, toss in wolfberries and cook for another 5 seconds. Remove and arrange in another paper cup liner at the side of the Mickey onigiri. 2. Next preheat saucepan with drizzle of oil, sauté garlic till fragrant add in assorted capsicum and onion cook for 30 seconds before adding in the shrimps. 3. Give the mixture a quick stir, add in ketchup mix well cook until prawn changed colour. 4. Turn off the heat, dish up and assemble it on bento container. 2. Arrange the serving bento with mickey head dragon fruits and some seedless fresh lychee of any fruits of your choice. Apart from the full set of Mickey Dinner Bento shown above, I have also made another Quick and Easy Mickey Breakfast Set using some of the "Bamboo Charcoal Bread" that comes in just in time to shape the face of Mickey. But if you cannot find any Black Charcoal Bread you can always replace it with chocolate bread too. These are the Mickey Shapes Food Cutter that I used used in making these two bento shown above. If you are interested to get hold of these cutters, you can either purchase them from online bento shop or for those living in Singapore, you can get it from Kai Kai Gift at level 2 of Chinatown Point. Lastly, I hope you would like these two set of Mickey Bento which perhaps could bring back some of your Disneyland trip or childhood memories. 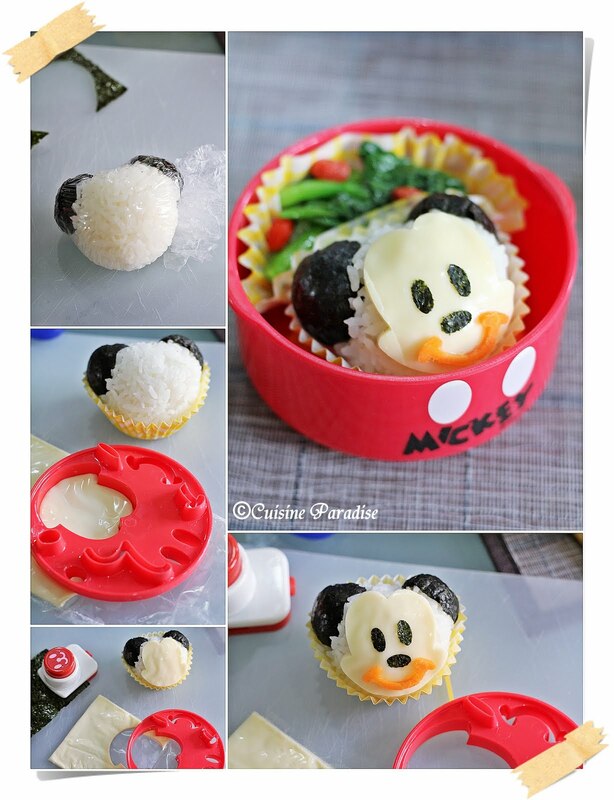 For the FULL Recipes of these Mickey Bento, you can refer to my Guest Post @ Rasa Malaysia HERE. Hi Ellena! I love these Mickey's bento!!! SUPER cute! So detail work....I don't have patience to do this! LOL. Congrats on your feature on Bee's site. 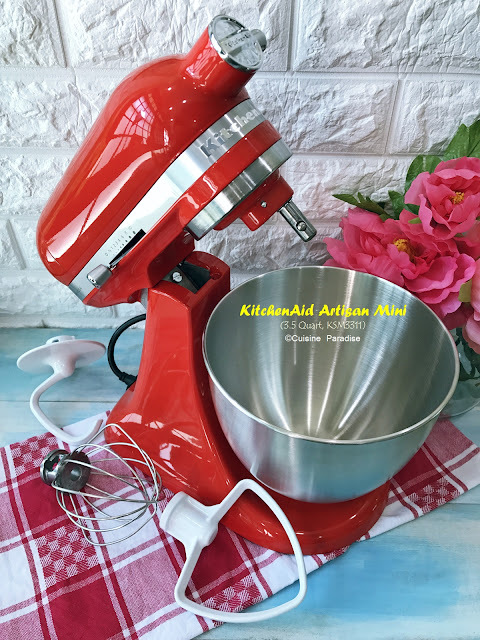 I'm heading over now to check out the full recipe now! Ohmigoodness these are all incredible! I love the little mickey veggies. From now on...I want all my veggies 'Mickey' style! Hi Ellena, that looks sooo cute. Forget about kids bento, I would love to enjoy that bento set, too. LOL. Congrats on being featured on Rasa Malaysia! No worries Bee, thanks for having me over Rasa Malaysia :) Do rest well and take care. This looks really beautiful.I love it. Looks very beautiful.I like these dinner sets.They are fantastic.